Items 22- out of displayed. EURGBP is trading sideways for the last two years within a very big contracting range. We see that path as a five A-B-C-D-E move where each leg has a characteristic of a correction. It’s a triangle that can be coming to an end of wave B so despite very strong leg up in the last few days, this can be still just an early start of a much bigger bullish trend that could lift pair even back to 2016 highs once the upper trendline around 0.91 is broken. However, what really matters to me at this point is a bounce from the lower trendline support which means that new, at least temporary swing is now underway to the upper side of a range; to 0.9000. So from a trading perspective, despite potentially limited upside there is room for trades on the long side, especially if bounce from 0.8655 will unfold in five waves. For not that’s not the case yet, but seems like it’s going to happen. So with that being said, a three wave A-B-C pullback on hourly chart can be interested for longs. This view remains valid as long as 0.8655 level is not taken out. After a long time I have decided to make a new video analysis, covering some of the charts on cryptocurrnices that suggests to me that bears are not done yet. There is a slow price move, a lot of triangles all over the place, so new lows may occur as contracting range can represents a continuation pattern. Also, there was some nice rally on BCHUSD but resistance may not be far away. Overall speaking, I think bulls will come but we may have to wait till next year. Not only EOS, the whole Crypto market looks slow and corrective within still ongoing bearish trend! Honestly, we don't see any bullish evidences and if we listen to the price action and if we respect correlations, then we should be aware of more weakness in the Crypto market. So, looking at EOS 4-hour chart, we can see a five-wave sideways movement a-b-c-d-e with three legs in each wave which can be forming a triangle pattern. In EW theory, a triangle is a corrective pattern that indicates a continuation of the trend. That said, seems like EOS can be headed lower while it's trading beneath 6.1 region, but keep in mind that this triangle may become even more complex, so invalidation area remains at 6.8 level. 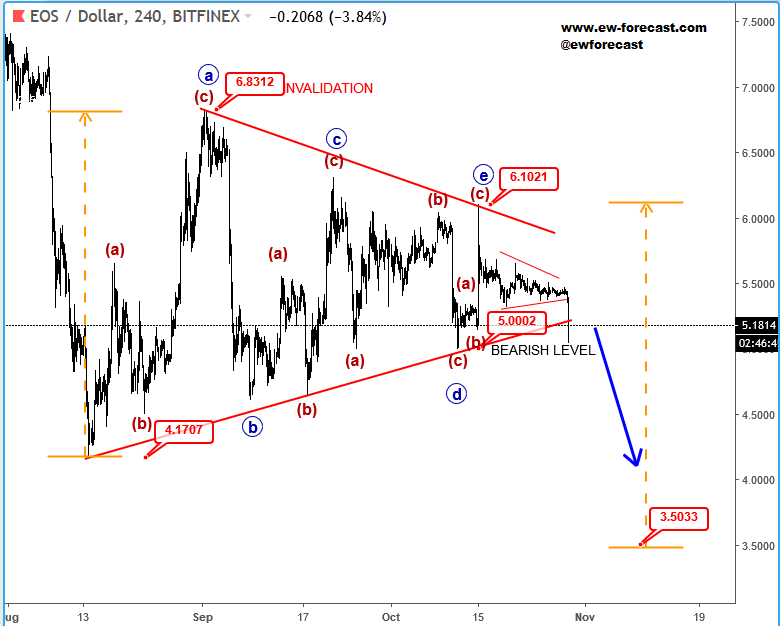 However, to confirm a completed bearish triangle pattern, we need a break below 5.0 region that can open door for new lows even towards 3.5 area! Also, keep in mind that this can be the final leg into new lows before a bullish reversal, which means that downside can be limited, so watch out for spikes as well! Only an impulsive rally back above 7-8 area would indicate a bullish reversal, until then we have to remain in bearish mode! Yesterday I recorded almost 30mins long video analysis, covered a lot of major markets and important developments. 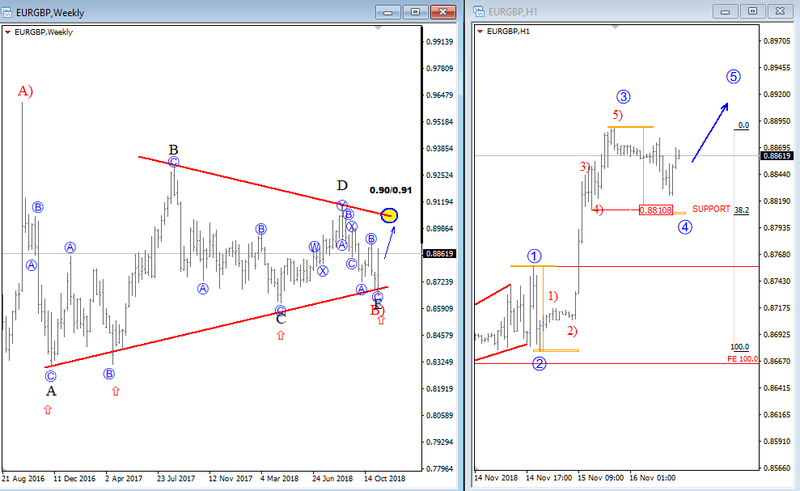 However, I decided to give you a free update here on EURUSD and USDJPY. Because of a lot of request for chart updates on twitter I have decided to make a coverage of some markets in todays video format. Its much easier. I covered GBP, EUR, SP500, DAX, OIL, GOLD, CHF. Bitcoin is trading bearish for the whole 2018 year and seems like it can stay under pressure till the end of 2018. 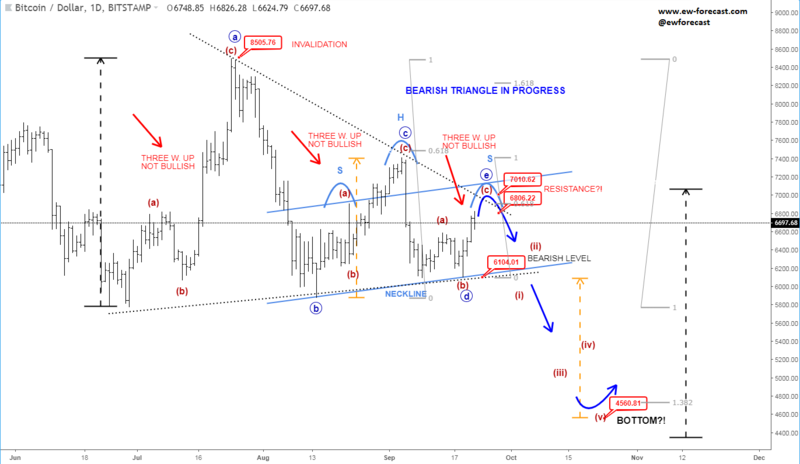 As you know, an ending diagonal is one option as Grega highlighted it in video analysis (click here) and what we currently also see is a bearish triangle in progress, which is a continuation pattern, so another leg to the downside can be coming which Grega highlighted it as well in his outlook. We don't actually believe that BTC will turn up until we see a break into new lows first. We are sharing an interesting chart below, which has many evidences of a bearish continuation. 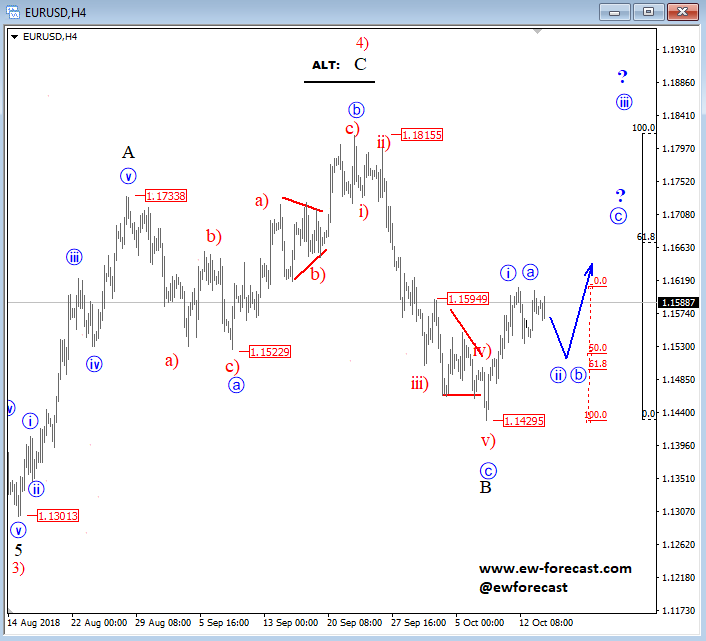 Firstly, as we said its a bearish triangle in progress due to repeated three leg structures within a sideways range, so trend remains down since we havent seen any five wave bounce from the lows. Another evidence is a potential H&S pattern, which also suggest more weakness once/if we see a broken neckline. There are also many strong trendlines that can act as resistance here around 7k. So as long market is trading below 8500 region, we have to remain bearish. Ideally we will see a continuation down soon, possibly towards projected 5k-4k area, maybe even a bottom in that zone early in 2019. However, for now we have to keep an eye on potential break below 6100 as this would be confirmation for more weakness.